Lorazepam, sold under the brand name Ativan, is a fast-acting strong sedative that is medically controlled, only legally available on prescription, although there are many other ways of obtaining Lorazepam illegally. Illegal distribution is an ongoing issue, obstructing the successful recovery for many who are fighting their Lorazepam addiction. Lorazepam is highly addictive due to its potency and should only be used for short-term medicinal or therapeutic purposes. It is mainly prescribed to treat acute episodes of anxiety. Some more chronic medical conditions such as epilepsy may require longer-term use, along with other medications to stabilise a condition. If you have an addiction to Lorazepam, it is likely that you will need professional help in stopping. Stopping this addictive medication safely can prove very difficult and challenging. In this article we will explain to you exactly what Lorazepam does, the effects it has on your body and brain, how addictive it is and why, the dangers of withdrawal and long-term use, the danger of mixing Lorazepam with other drugs or alcohol and most importantly of all, the treatment options that are available to help you recover from an addiction or abuse problem. Lorazepam, commonly known as Ativan, is a medication that is controlled by the Substance Misuse Act 1971. It belongs to a group of medications known as Benzodiazepines. The substance works on the brain and central nervous system to produce a calming and muscle relaxing effect. It enhances the effects of GABA (gamma-aminobutyric acid), a naturally occurring chemical in the brain. GABA is an amino acid that is organically produced by the brain; it inhibits muscles and neurons from firing which can lead to anxiety, panic and muscle spasms. Lorazepam enhances this amino acid, promoting calm and relaxation in the brain and in the body. 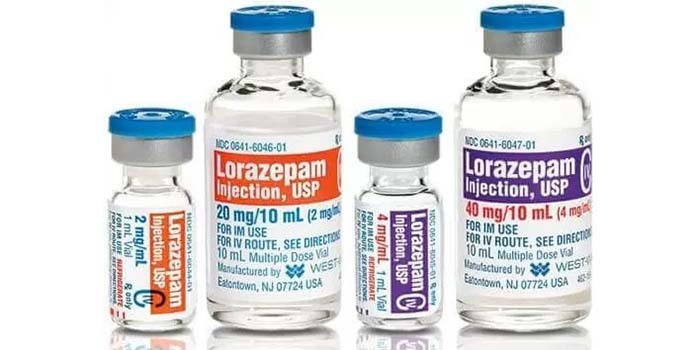 Lorazepam is also used medically to treat alcohol withdrawal, insomnia, PTSD, stopping active seizures and treating chemotherapy-related vomiting in cancer patients. It can also be used intravenously in hospitals for sedation. The effects of Lorazepam can generally be felt approximately within 20 to 30 mins of administration. Lorazepam can be administered orally in tablet form, through muscular injection or intravenously. Benefits to the patient last for up to 6-8 hours. When administered in larger doses, the effects can last up to 72 hours. 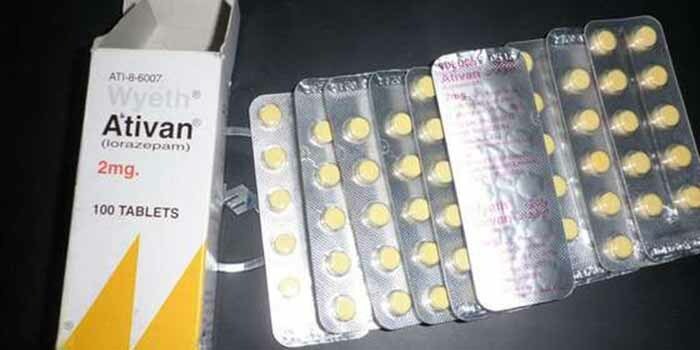 Ativan, the most commonly prescribed brand name of oral Lorazepam, comes in various shapes and sizes depending on the dosage. It is also available in injectable solutions (usually only administered in hospitals or by a qualified doctor). Lorazepam can be extremely difficult to stop once addicted and will cause you a lot of discomfort and anxiety. Medical intervention and therapeutic help will help you overcome the addiction. Stopping Lorazepam suddenly when your body has developed a dependence is extremely dangerous and life-threatening. Too many individuals die from benzodiazepine withdrawal as they are not aware of the dangers of stopping too quickly or abruptly. Please feel free to contact us if you would like guidance on how to approach detoxing safely. You can become addicted to Ativan within a very short time as your body and brain adjust quickly to the medication and build a tolerance and dependence. This can happen within as little as 10 to 14 days of continuous use, depending on the dosage and the frequency. 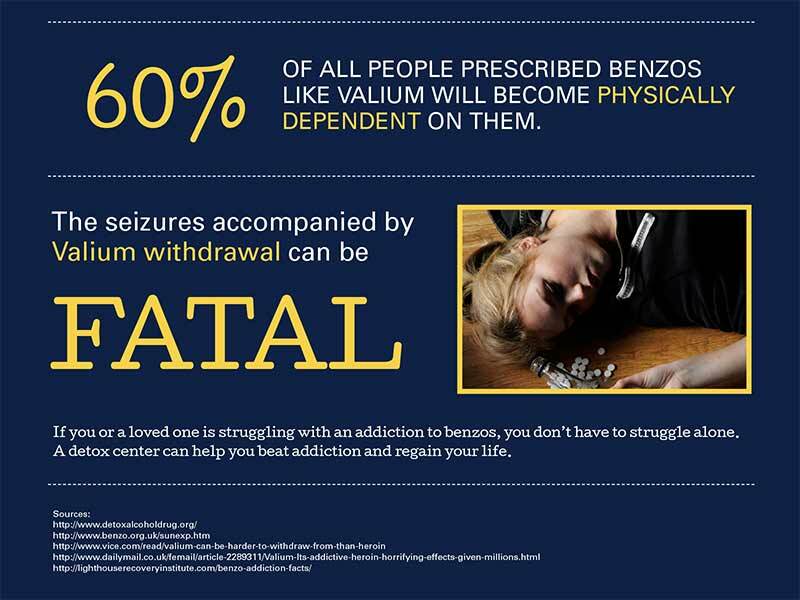 This is why Ativan, along with other medications of the benzodiazepine class such as Valium, are usually only prescribed on a very short-term basis. If you are prescribed Ativan, your GP should taper you off the medication if you have developed a physical dependence. It is worth bearing in mind, that if you suffer from addiction and have been using Ativan for prolonged periods of time, that you may well find a tapering off programme impossible to complete in the community. We understand this well; the illness of addiction is complex. That being the case, you may want to consider residential rehab in order to cease taking Ativan safely and to secure long-term recovery. Am I Physically Addicted to Lorazepam? There is a simple way of finding out if you have a physical dependence to Lorazepam. 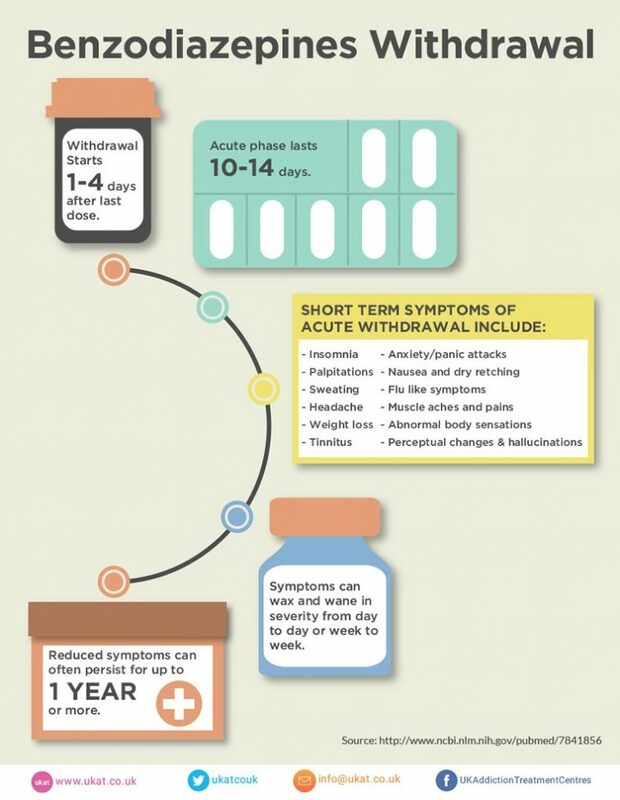 If you miss a dose it is likely that you will experience withdrawal symptoms within hours. This will begin with feelings of anxiety, agitation and panic. The symptoms will be quickly relieved by taking Lorazepam of the dosage your body and brain have become accustomed to. Leaving the withdrawal symptoms to develop longer can become life threatening! You can suffer from a dependence to Lorazepam without suffering from the illness of addiction. Addiction is both a psychological and physical need. Detoxing alone will not be sufficient if you are suffering from addiction by its true definition. You may also need help psychologically in order to prevent relapse. By the same means, continual abuse or prolonged use can cause you to develop addiction through biological changes in the brain. This will cause great difficulty in stopping and in staying sober. The bottom line is this: if you have tried to reduce the amount of Lorazepam on your own or with the assistance of a GP but have not been able to manage it, inpatient detox may be your only successful means of stopping the drug. One of the most prevalent psychological signs of Lorazepam addiction is the need for more and feeling panic and agitated when your supply is threatened. Using multiple doctors to gain prescriptions: If you are addicted and find your use is out of control, you are likely to go to the behavioural extreme of using different doctors to avoid arousing suspicion of abuse. If a doctor suspects abuse of a medication he or she will have a duty of care to cease the prescription. By using various doctors to gain prescriptions, suspicion and the chances of getting caught are dramatically reduced, thus you are ensuring your supply is constant and not threatened. 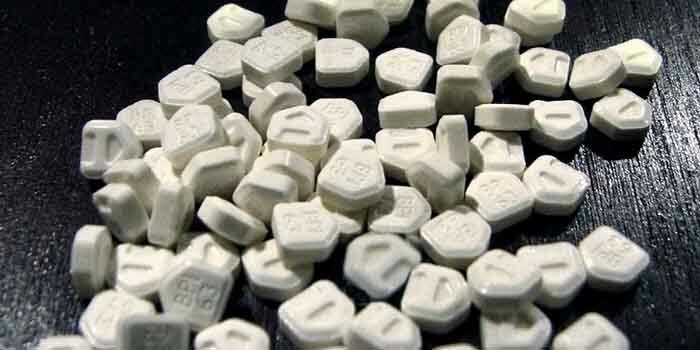 Buying Lorazepam online: No questions asked, discreet packaging, no prescription required – the darknet is a prescription drug addict’s haven of safety. It is easy to maintain and progress an addiction by buying online. WARNING: what you receive is not always as advertised. The lack of questions being asked and with little or no limit to the amount you can buy, you can quickly get yourself into a whole heap of trouble and end up with a very dangerous and financially hard to maintain addiction. The darknet has capitalised and grown due to the huge rise in prescription drug abuse. It may be that you are using this resource to also pad out prescriptions from your GP, again to avoid arousing suspicion. These behaviours may involve deceit, secrecy, manipulation and even theft from loved ones in order to fund a growing addiction. Thus, they may eventually lead to intense feelings of fear, shame, guilt and remorse. If you are physically addicted to Ativan, then you will experience withdrawal symptoms on trying to stop or reduce the medication. The symptoms of Ativan withdrawal are very distressing and unpleasant. They can be life-threatening, especially if you have been using the drug for prolonged periods of time and/or in higher doses. 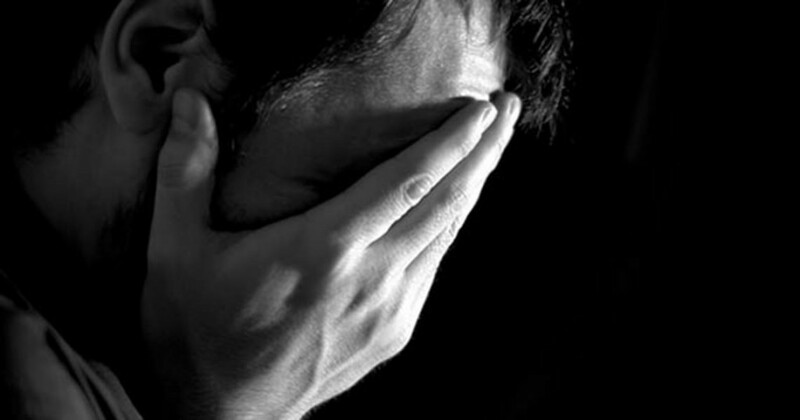 Increased Anxiety, panic attacks, audio or visual hallucinations, paranoia, severe depression, confusion, cognitive impairment, inability to focus or concentrate, short terms memory loss, suicidal thoughts and ideation, thoughts of self harm, irritability, aggression, racing mind, obsessive thinking about the drug and how to obtain more to relieve the symptoms. How Common Is Lorazepam Addiction? Long-term use of Lorazepam can lead to you developing serious health issues, even after stopping the drug (protracted withdrawal symptoms). The risks associated with prolonged or heavy use can impact on you psychologically and physically whilst using and for many months or even years after quitting the drug. This is why a full and comprehensive rehabilitation programme can be life-saving. 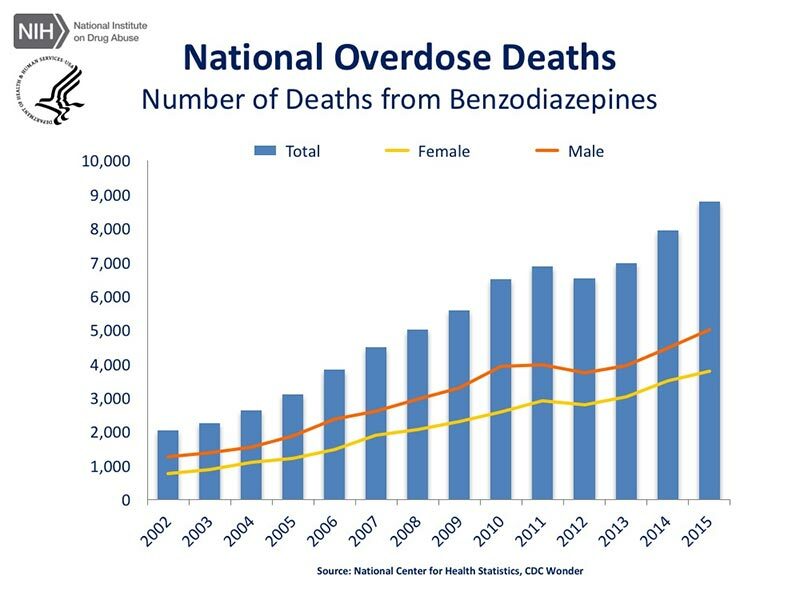 The National Institutes of Health (NIH) has statistically reported a steady rise over the years in the number of benzodiazepine-related deaths; this includes Lorazepam amongst other BZ medications. The evidence is clear, the problem is growing, and more individuals are dying each year as a result. Males in particular of middle age have been noted to be particularly at high risk of overdose and death from benzodiazepines. The elderly are most commonly prescribed these dangerous and addictive medications on repeat prescription. Perhaps the reason for this is that GPs feel it is too risky to detox them to withdraw, as they are more prone to complications. However, detox can be safely achieved residentially in a professional detox facility. Opioids and benzodiazepines used together present the most lethal concoction and are most responsible for the huge rises in deaths each year. Lorazepam, along with other commonly prescribed benzodiazepines such as Diazepam and Xanax, can be fatal when taken in larger than prescribed doses or mixed with other drugs, opioids in particular, and/or alcohol. Prescription drug abuse is overtaking illegal drug abuse. Many of the rehabs and statistics we have observed have relayed this information to us. Mixing any Benzodiazepine with another depressant such as an opioid or alcohol has been proven to be particularly dangerous and the main cause of benzodiazepine-related deaths. This is information that every benzodiazepine user needs to be made aware of. 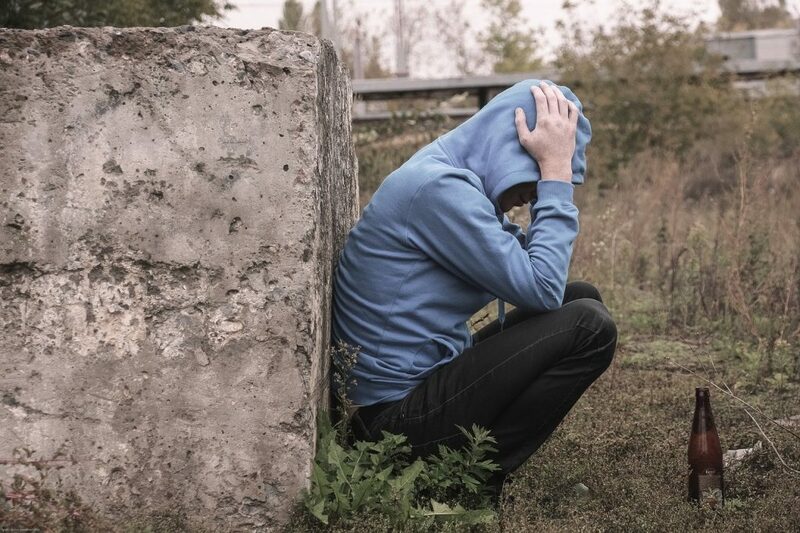 If you have the illness of addiction, you may well have started experimentation at a young age, then progressed onto abusing a certain substance or substances. The younger and you start to use alcohol and drugs, the more damage is caused to your brain as it is still developing – regardless of the substance. The more entrenched you become in the substance, the more damage to your brain is caused. The more damage, the less choice you have in the matter as there will be severe cognitive impairment as a result. Yet thankfully, you do still have a choice, and that choice is to ask for help and harness treatment that will help you to detox and stay in recovery. Addiction is characterized by a compulsive need to engage the brain with a rewarding stimulus, whether it be a chemical, an activity or a behaviour, regardless of negative consequences. There is a heavy element of psychological factors which can drive an individual to addiction, which then becomes a biological process through changes in the brain. These biological changes occur through repeated exposure to an addictive stimulus; this pathology then becomes the driving force of the progression and maintenance of an addiction. Manipulating and lying to others in order to cover up the addiction and sustain it. Mounting negative consequences to health, mental well being, emotional stability, finances and loss of security and trust in work and relationships. Feelings of powerlessness, numbness and despair. Addiction is life-threatening and hugely self-destructive. If you have an addiction, the substance or behaviour is irrelevant when it comes to the psychological and biological factors that characterise this illness. But if you are addicted to Lorazepam, the drug will become your everything and take over every area of your life, destroying it and you bit by bit. If you are suffering from addiction to Lorazepam and want to stop, it is likely you will relate to the lack of ability to stop taking Lorazepam and change your behaviours by yourself, or even with the support of loved ones. In other areas of your life, you may well still be able to exert willpower and function well, with the assistance of this medication. If you are addicted, you will certainly be able to assert willpower to maintain your addiction. You will feel compelled to carry on in your addiction despite mounting consequences and harm to yourself and to others. This is a very heartbreaking and soul destroying place for any individual to exist in, yet there is hope! Recovery from any Benzodiazepine addiction, including Lorazepam, is possible with the correct medical and professional help. Developing an addiction is not yours or anyone else’s fault, but seeking and accepting support to stop and change is a choice you do have. If you have arrived at the point where you have a great desire to stop but find it impossible, then you certainly need professional treatment. If this is the case, asking for help is the first major step to recovery. We witness the miracle of recovery on a daily basis. If you want help for you, or for a loved one you are concerned about, please contact us. We can guide you to the correct sources of support, and assist you in taking those first few frightening but life-saving steps. Lorazepam and other Benzodiazepines are notoriously difficult to stop because of the uncomfortable and sometimes lengthily withdrawal symptoms produced. There is no one size fits all when it comes to successfully treating Lorazepam addiction, as each person will have their own individual issues personal to them. A tailored treatment programme is vital and can provide the foundations for a long-lasting and happy recovery. Addiction is medically defined as a “chronic relapsing brain disease” by Public Health England (PHE) and the National Institution on Health and substance misuse (NIH). Recovery is generally only achievable through a structured and intensive detox and rehabilitation programme. It is important to understand that if you are suffering from Lorazepam of any other type of addiction, that there is no quick fix. Recovery is achieved first and foremost through total abstinence, and then a complete change in the way you think and deal with your emotions. This must then be maintained for the rest of your life. A good detox and rehabilitation programme will provide you with the tools needed for the practical application to daily living. It is necessary, that if you suffer from addiction, that you are able to be comfortable with yourself and in your surroundings and on a daily basis. By continuing to use recovery tools and dealing with the issues underpinning your addiction, long-term and permanent recovery are achievable. If you want to stop taking Lorazepam, but find you cannot, there are only 2 ways of safely achieving this. Both methods involve asking for and accepting help. If you have already attempted to reduce by yourself and failed, it is time to seek professional help and input. Whatever you decide, do not stop taking Lorazepam suddenly – this can prove fatal! Admit to a private residential detox facility and undergo a medically prescribed and monitored detox regime, away from temptation and potential triggers. You may find it impossible to stop in the community; rest assured many struggle with this due to the nature of the withdrawals and intense cravings a reduction regime produces. It is not you that is failing, but the community detox system. Sadly, the NHS fall very short in providing the intensive levels of support required to sustain an individual who is detoxing from a benzodiazepine dependence. This is why many will, if they can, opt for an inpatient medical detox, which shows the highest rates of success and is the safer and quicker option to detoxing in the community. Detoxing from Lorazepam can be challenging, but if carried out within the safety of a rehab centre, every measure will be taken to ensure you are as comfortable as possible throughout the detox. You will also have medical and therapeutic staff on hand all hours of the day and night to help. Detox is the first step in recovery from Lorazepam addiction, ideally, you should also undergo an intensive therapeutic programme of rehabilitation. Unless you armed with different coping mechanisms and ways of managing your emotions or problems, it is highly likely there will come a time when you return to the drug once more. Once detoxed, it is then important that you address the issues underlying your addiction through professional therapy in order to remain abstinent. Lorazepam treatment programmes can be accessed through addiction treatment centres, where you will also be able to detox if necessary. If you have already detoxed but are finding it hard to stay off Lorazepam, a personalised programme of recovery and therapy can make all the difference to your life. Rehab programmes for Lorazepam addiction are tailored to your specific physical, psychological, emotional, social and spiritual needs. Many also provide family support in-house and aftercare. It is essential that once you leave the treatment environment that you are supported in your recovery. Residential rehab offers the most specialised treatment available, they offer both short- and long-term programmes within a distraction and temptation-free environment; one that is well suited to longlasting recovery from addiction. If you think it would be hard to fund rehab or, due to commitments, are unable, the NHS provide treatment which you can access through your local GP and drug and alcohol team. 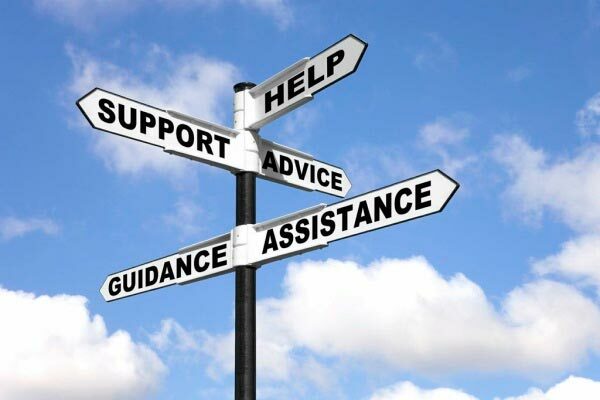 12 Step fellowship meetings and Smart Recovery also offer support in the community; engaging with all sources of free or NHS services can be very helpful to getting well. Addiction Helper work with over 100 regulated and Care Quality Commissioned rehabs in the UK and overseas, specialising in delivering first class addiction treatment. Whether you want affordable or luxurious rehab, we can help. Our rehabs are staffed by Counsellors, Doctors, Therapists, Nurses and Support Workers. Where there is a need, we also have rehabs that employ Psychiatrists, Trauma specialists and mental health workers. We only deliver the latest evidence-based medical, psychological, and holistic treatments available. By contacting Addiction Helper, we can assess the severity of your addiction and other relevant factors involved; from there we can advise you on the programme that will fit with your individual treatment requirements and can arrange urgent admission. We are here to help and ensure that every aspect of your treatment is covered. You can break free from addiction to Lorazepam permanently and start your journey to a brand new life today!